As a tourist centre Ambleside has a long and favourable history. For well over 150 years the town has earned a living catering for visitors, giving them mostly what they wanted, provided they didn’t mind what they got. The last twenty five years have seen a revolution in tourist provision however, as upgrading of catering at all levels has been led by the market and by encouragement from official bodies. Few could nowadays claim that they cannot enjoy the level of catering they expect. All sectors of the market, from campers to gourmets, will find satisfactory establishments in Ambleside and its outlying hamlets and villages. The town is easily reached by road, being 20 miles from the M6 motorway, and is served by several bus services, including National Express. Rail travel is to Windermere, four miles away with easy bus and taxi access. There is a direct Manchester Airport/Windermere rail link. Ambleside is a very convenient starting point for excursions, walking, cycling or driving, into all areas of the Lake District, situated as it is at the hub of the area’s road system. For illustrated notes on Ambleside’s historical background, please visit our History page. The proliferation of guides, maps and books on the Lake District is the main reason for having to rebuild the British National Library, allegedly. There is a frighteningly long list of all types, from pretty picture books to walking guides to accommodation to literary to art. Lakeland is a publishers’ paradise – sell 2000 hardbacks in 12 months for a quick buck then remainder the rest. Anyone wanting a reliable reference to what is good in the Lakes could do worse than buy A GOOD GUIDE TO THE LAKES, an annually updated version of what author Hunter Davies and his discerning team of locally based researchers think to be the best on offer. This includes much more than accommodation and is written by people who should know. The WEB seems to be going down the book publishers road, spawning a proliferation of sites all claiming to be the best, most authoritative, official guide to the Lake District. But none beat Ambleside Online if it’s Ambleside you want to know about! And quite a few of them rip off our texts, being either too lazy, too ill-informed or incapable of writing anything original themselves. Ambleside OnLine uniquely lists every business in the Ambleside area, including all accommodation and catering establishments. To find bed and board, you can either go to our Accommodation pages, where all businesses are listed, many with display ads, web links and direct booking/enquiry facilities, or click here if you want the local Tourist Information Centre to make reservations for you. For a broader view of what is on offer in the Lake District as a whole the Cumbria Tourist Board website is worth a look. Their accommodation listing covers the entire county but is limited to CTB members only. Lake District National Park Authority is a useful site, for background information on the aims and management of the Park. This is a subject of some complexity. It depends on what you are. Some locals often wonder why anyone bothers to come, but they have long since taken their surroundings for granted. Mainstream activities in the Lake District have an outdoor emphasis, combined with simple leisurely enjoyment of the magnificent scenery and its literary and artistic heritage. The area is justly famous as an escape for stressed out urban dwellers, who come to enjoy a little solitude as they walk the hills. 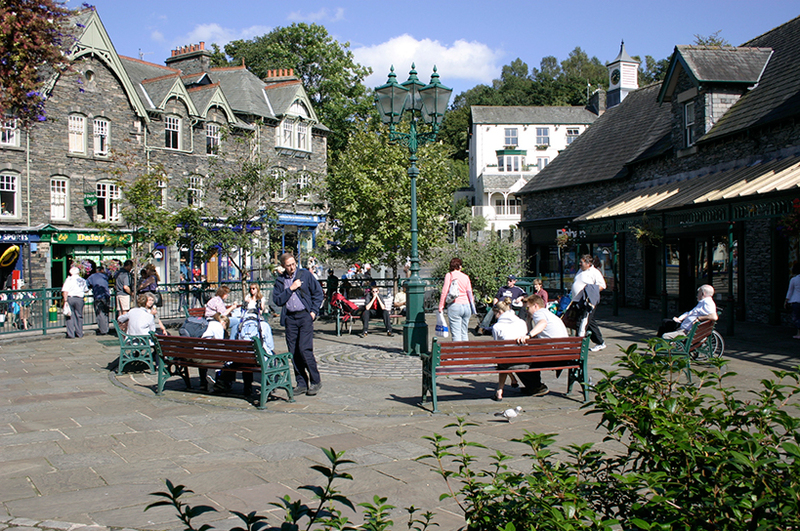 Specialist shops, particularly in Ambleside, offer a welcome variation on High Street chains, while galleries and small museums allow quiet contemplation. The area is equally famous for its high quality mountaineering opportunities, being the centre of English rock climbing and the country’s most popular upland walking area. A good stay in Ambleside for the general visitor might include something of all these interests, combined with an occasional dinner in one of many high quality restaurants and a sampling of the vast selection of real ales available in the pubs. If you are a sober, contemplative, quiet sort of person who enjoys fine landscape, natural beauty and healthy exercise, you couldn’t come to better place. If you are a bon viveur, you will not be disappointed in the standards and wide range of catering and accommodation available here. If you are a crag rat, you won’t need telling about the great climbs of every class. If you just want a good time, relaxed atmosphere and a disco at night, we’ve got all that. If the great outdoors is what you want, at local shops and info centres you can buy books and leaflets telling you how to get on to the fells (northern English hills/mountains). For a taste of Lakeland walking, have a look at our walks page. Mostly you don`t need leaflets, you just put one foot before the other in a forwards and upwards direction until the only next step is down. Then you will gaze in wonder at the spectacle below you and vow never to do it again – unless, that is, you become hooked. At this point you will become a danger to the local community, because before long you will be so addicted to walking hills, even climbing crags, that you will want to buy a second home here and do some ill-paid local out of the chance of a first one. You may then eventually join a local environmental pressure group and complain when the District Council wants to build new starter homes for locals. Believe it, people do! Ambleside, gateway to the famous Langdale valley, is also a major rock climbing centre. There is nothing made that you can’t get here in the way of equipment and guidance. Mountain Biking is trendy and popular and bikes are available for rent in Ambleside. This activity, which requires a level of fitness and stamina seldom apparent in the average tourist, has aroused controversy and there is regular conflict between walkers and bikers. This is usually due to bikers using footpaths (where they are not allowed) instead of bridle paths. They usually pretend they didn’t know they weren’t allowed on footpaths, or they didn’t know it was only a footpath, and this makes the walkers even madder. To repeat, Ambleside (recently dubbed “Anorak Capital of the World”) is home to very few “High Street” chain stores. Instead, you will find an amazing variety of individual shops, some of them specialising in uniquely local products, including slate ornaments, and original or reproduction watercolours of the famously beautiful Lakeland landscape as well as original works by contemporary painters, sculptors and potters. And if you need outdoor clothing, wait till you get to Ambleside! At the last count there were 16 retail outlets specialising in the great outdoors, which means that you can probably find a better choice of outdoor clothing here than you can anywhere else. To support local craftspeople, look for quality gifts and mementos bearing the Made in Cumbria logo. Despite all kinds of persuasion, cajoling and sometimes active discouragement of motorists by the local authorities, the car remains the ideal and most popular way of getting around the area, making it possible to stay in one place and make daily excursions. The Lake District contains a thousand destinations of interest, from the start of classic walks and climbs to its great houses, churches, galleries and museums. Ambleside is no more than one hour’s drive away from any one of them. Outside the main urban centres, few of these destinations are adequately served by public transport, which is expensive and infrequent. Park & Ride schemes don’t exist. However, for the car-less and the car-haters, things are getting slowly better and it is possible to plan many enjoyable excursions by bus and on foot. And where you can go by car, you can also go by bike, if you like plenty of exhilarating hills and don’t mind mixing it on narrow roads with the buses and the cars. Safer biking routes are being developed and maps are available locally. Go to our Transport page for transport links within and outside the county.